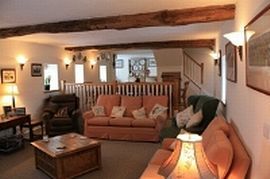 A complex of 3 holiday cottages, sleeping from 2 to 22, set within the gorgeous Peak District - Uppermoor Farmhouse and Holiday Cottages by Parwich date back to the 18th century. The complex stands in 70 acres of rolling fields with typical Derbyshire dry stone walls, gardens and woodland. Uppermoor Farmhouse sleeps up to 12. The largest of our holiday cottages the Farmhouse is spacious and luxuriously appointed. The galleried dining area looks across the sitting room towards the log burning stove. The kitchen features a range cooker and every convenience. The five bedrooms each have luxury en-suite facilities. Horseshoe Cottage sleeps up to 6. Horseshoe Cottage sits in the corner of the courtyard and has a cosy country feel. The kitchen diner leads to a lovely sitting room with a log burner and a reading corner. The three bedrooms are situated one on the ground floor and two on the first floor. The Coach House sleeps up to 4. Looking out over the courtyard, the Coach House has a lovely open plan kitchen and sitting room area with log burner. 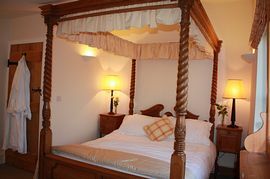 Along the flag stone hallway there are two lovely bedrooms each with en-suite bathrooms. Combine all three cottages to sleep 22. You certainly won't be short of things to do Derbyshire and the Peak District National Park is a fabulous area. Quality towels and bed linen are provided. Just off A515 Ashbourne - Buxton Road with full directions given on confirmation of booking. Uppermoor Farmhouse from: £700 to £1900. Horseshoe Cottage from: £350 to £895. The Coach House from: £300 to £620. Combine all from: £1350 to £3400. Open all year with short breaks sometimes available.